How would damage be dealt when doubled to multiple blockers. landofMordor, unfortunately there are commands for all the dragonlords we have, but wouldn't it be fascinating if enemy-colored dragonlords rose up, combining somehow (likely in set 3 after a lengthy conflict) with the ranks of the present dragonlords and making them 3-color again? 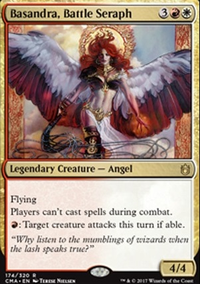 Also, there's not a fourth angel sister on Innistrad. 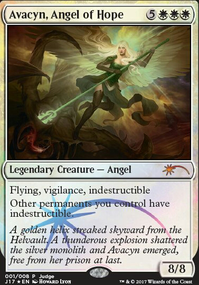 We have Gisela, Blade of Goldnight , Bruna, Light of Alabaster , and Sigarda, Host of Herons . 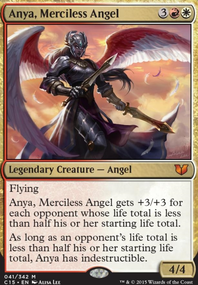 Some would consider Avacyn, Angel of Hope to be among them, but she kinda went crazy and died so... not anymore. Even so, we got three different cards for her. We're good. 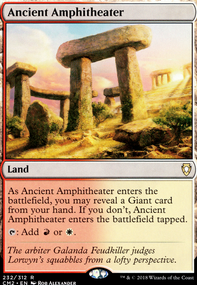 Unfortunately haven't been able to play much this past couple weeks outside of my budget commander league (under $50). Turn 1 is definitely not as frequent as I would like, but the cards to make Turn 1 more consistent make T2-5 less consistent in most cases. Dark Ritual is one that's pretty good all purpose and a T1 enabler if you want to improve your average. I'm going to put Gamble back in, probably taking out Terminate but going to do a full evaluation. Hatred + Baneslayer Angel or Gisela, Blade of Goldnight or Gisela, the Broken Blade or Lyra Dawnbringer or Serra Ascendant all work good. Gisela, Blade of Goldnight doubles the benefit, and Kaalia of the Vast only needs 19 life to be lethal with Commander damage. Any lifelink can swing for the fences, except Serra Ascendant he's not that effective because he loses the +5 but still doesn't matter because he lifelinks. I picked up a Hatred last weekend, going to try it and will let you know. I really dislike it's CMC5, feels too slow. 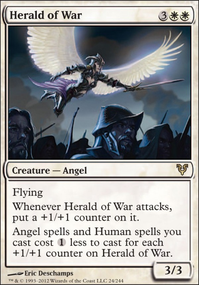 Felidar Guardian is just another Restoration Angel and putting in Altar of the Brood just for one particular interaction (no other benefits), isn't a good process. 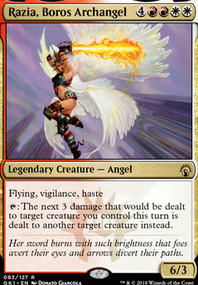 I would just tutor the Restoration Angel + Kiki-Jiki, Mirror Breaker . Altar of the Brood could replace the Goblin Bombardment if you wanted to test this interaction, works the same way basically. Hellkite Tyrant is amazing, steals mana rocks, kills Breya, Etherium Shaper , etc. I'll let you know when I have some evaluation on Combat Celebrant or Hatred . Titus78 thanks for commenting! I used to have Exquisite Blood included, along Sanguine Bond . But I don't want to use those two cards in this deck anymore. 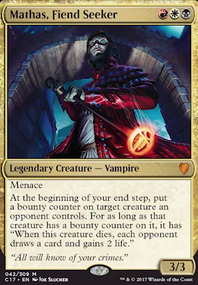 My Edgar Markov -Deck should be more like Vampire tribal, even though it might be weaker. 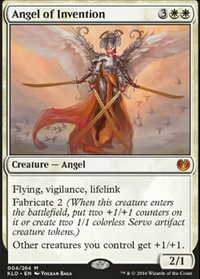 Despite that, both, Exquisite Blood and Purphoros, God of the Forge cost quite some mana to cast. Usually, you want to play just more Vampires and keep going instead. Purphoros, God of the Forge might be a good addition, but in my opinion, since you don't have some sort of combo in the deck included, it's only good, but not amazing. Also, since I cutted Aurelia, the Warleader and Gisela, Blade of Goldnight , I focues on only playing Vampires as creatures, so Purphoros, God of the Forge won't fit in the theme, aswell. Alhammarret's Archive actually might make it into the list very soon. I tried out Well of Lost Dreams because I thought it would be the better of the two and was thoroughly disappointed. Now having played the deck quite a bit I think that the Archive is a much better fit and could do some insane things with the draw spells the deck has access to. 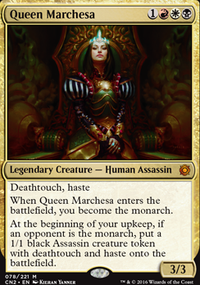 One of Gisela, Blade of Goldnight / Axis of Mortality / Sword of War and Peace could be swapped out for it easily. 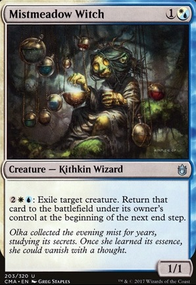 The downside is, it's CMC5 (), and needs sac outlet and Enabler Kiki-Jiki, Mirror Breaker or Karmic Guide . 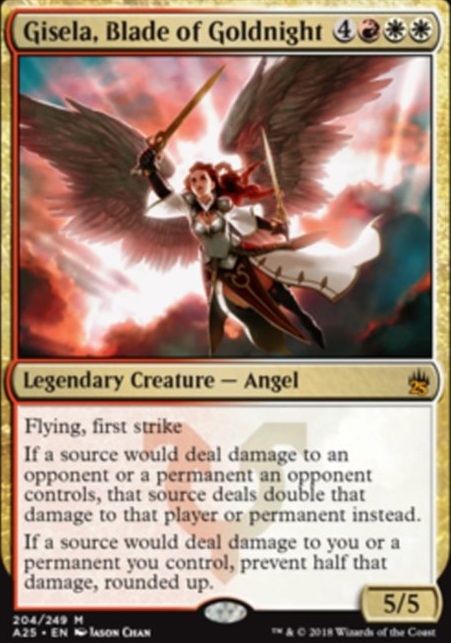 Hatred is CMC5 () and just needs Kaalia of the Vast but also likes guys like Baneslayer Angel , Gisela, Blade of Goldnight , Gisela, the Broken Blade , Lyra Dawnbringer , Serra Ascendant or Whip of Erebos . Was thinking, it's a different win-con (only 1 player too in some cases), but other than being high CMC, would allow me to cheat in an A/D/D and Commander Damage kill a player if left unblocked as well (Instant speed). 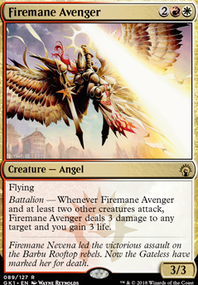 Combat Celebrant is enticing because of his CMC3 (), other than his obvious Exert ability which can land 2 A/D/D in 1 turn, do some mass damage with someone like Balefire Dragon or Gisela, Blade of Goldnight , but his real power is that he doesn't need the sac outlet. 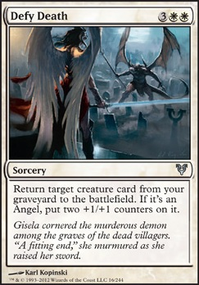 Potentially a win-con with someone like, Avacyn, Angel of Hope , Demonlord Belzenlok , Doom Whisperer , Hellkite Tyrant , Razaketh, the Foulblooded , Etc. unless there is something large enough to block the Trample indefinitely. Doesn't matter if Combat Celebrant is blocked, just making the copy, allows for the next attack to occur. Kiki-Jiki, Mirror Breaker never gets in harms way. I'm sure there are more ways to abuse him, Splinter Twin obviously, which doesn't work with Buried Alive but can replace Kiki-Jiki, Mirror Breaker in most/all? combos too. could tutor Splinter Twin pretty easily. Idyllic Tutor for example could also pull me an Animate Dead etc, feel there could be some good build out around Combat Celebrant for combos, and just his natural talent when attacking with large A/D/D. I just found neither Adarkar Valkyrie or Aurelia, the Warleader properly ETB triggered with Kaalia of the Vast , and I was never tutoring either of them because they aren't that impactful, so ended up removing Adarkar Valkyrie and then later Aurelia, the Warleader to focus more on the primary win-con with Kiki-Jiki, Mirror Breaker + Restoration Angel . 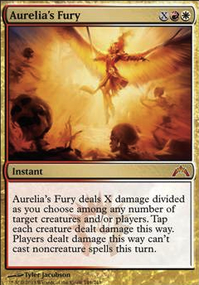 Crucible of Worlds more inline with a classic Kaalia of the Vast , which the Infinite Combat phases + Land Destruction is part of the reason (as well to a degree the amount of hate Kaalia of the Vast receives as a commander), is why she fell to Tier 3, from Tier 2.5 previously. 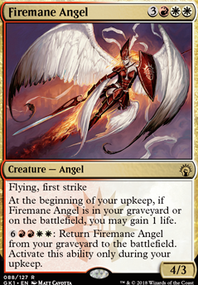 If I have a Grand Abolisher I don't care, but if I don't, sometimes there is surprise when they have 40 life and think they are unkillable by Kaalia of the Vast and leave themselves open and I can swoop in on T4 with the Restoration Angel horde! Entomb > Kiki-Jiki, Mirror Breaker + Mausoleum Secrets > Reanimate . With a Combat Celebrant and anything to attack with, I'm good to go. ( Entomb makes Mausoleum Secrets more valuable to me too). He also doesn't get haste from Dragon Tempest either, so that's another negative. He can't really Turn 1 so that's kinda why I was thinking more along the lines of Hatred even without augmenting the Lifelink. 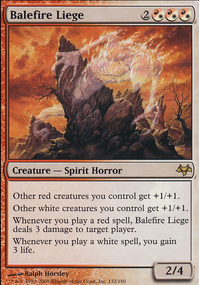 Life also fuels my speed, Draw/Mana/Tutor, so not sure of the impact to my game post Hatred . Dark Ritual , Simian Spirit Guide , Mox Diamond all increase T1 potential, but I always worry about, outside of T1 do they have much value. Dark Ritual can cast a Necropotence so it has some benefit and with other cards Buried Alive + Reanimate . My current challenge is Faithless Looting , I think it needs to go back in, have to decide what to remove. 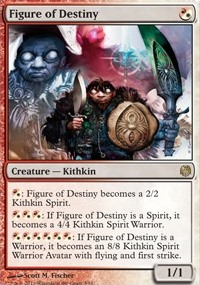 In games where I draw my Karmic Guide or Kiki-Jiki, Mirror Breaker I'm usually like T9 because I have to actually cast them and at CMC5, it's just not realistic with the other costs ( Buried Alive CMC3 and Reanimate CMC1) thats, CMC9, never going to happen. A Faithless Looting makes it CMC5 only. Faithless Looting also has some nice synergies if I don't have an A/D/D in my hand and Kaalia of the Vast is ready to go. I agree, when is a deck every truly complete. Ever time I play I learn something new about my deck, or a Razaketh, the Foulblooded comes a long and takes over top dog spot in my decklist, and makes Griselbrand being Griselbanned a little easier to take.